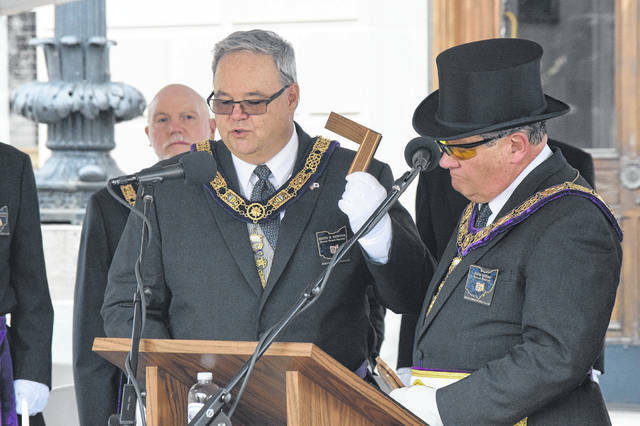 The Preble County Courthouse cornerstone is now home to a new time capsule, to be opened in another 100 years. 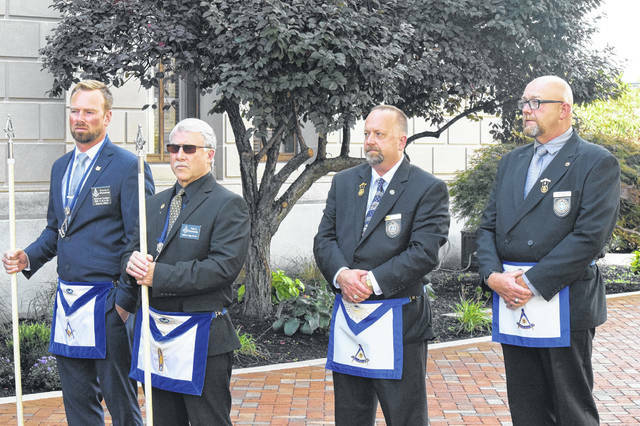 On Saturday, Oct. 6, a special time capsule ceremony was presented by the Grand Lodge of Free and Accepted Masons of Ohio. 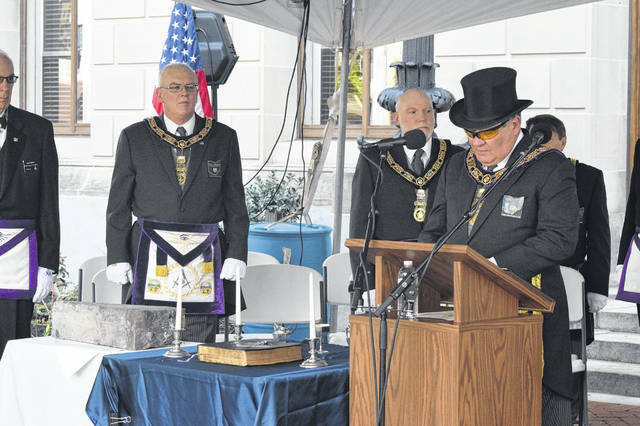 EATON —The Preble County Courthouse cornerstone is now home to a new time capsule, to be opened in another 100 years. 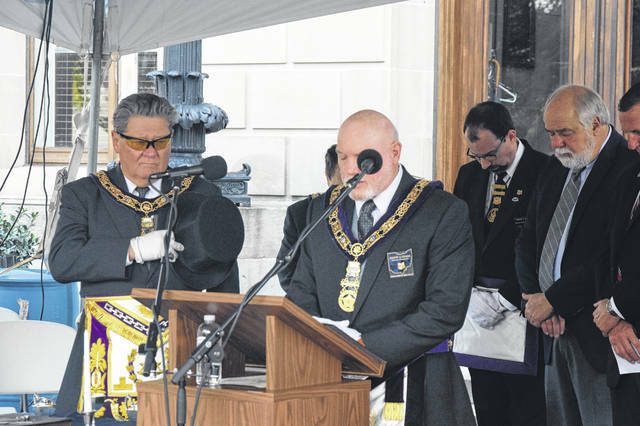 On Saturday, Oct. 6 a special time capsule ceremony was presented by the Grand Lodge of Free and Accepted Masons of Ohio. 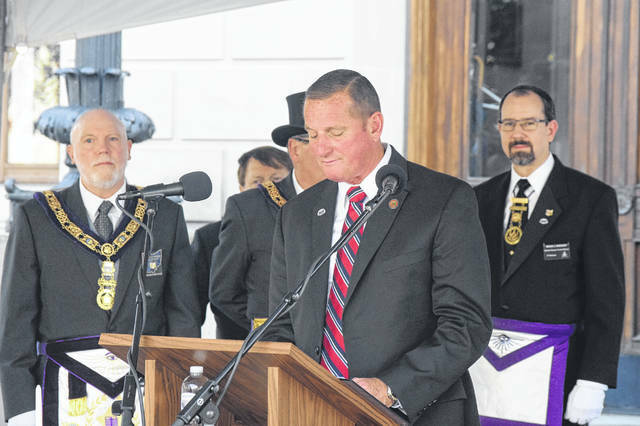 Commissioner Chris Day opened the ceremony with his comments on the momentous occasion. 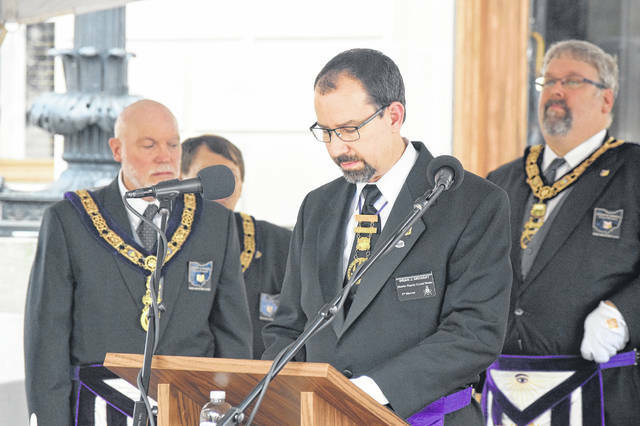 “We are here today to place the time capsule back into the cornerstone so future generations can have a snapshot of what Preble County looks like today as we live here. 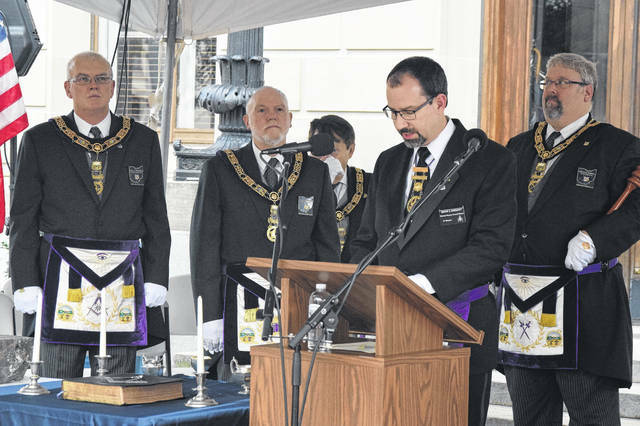 The definition of a time capsule is, a container holding historical records or objects representative of a current culture, deposited, as into the cornerstone, for the preservation until discovery by future age,” Day said. 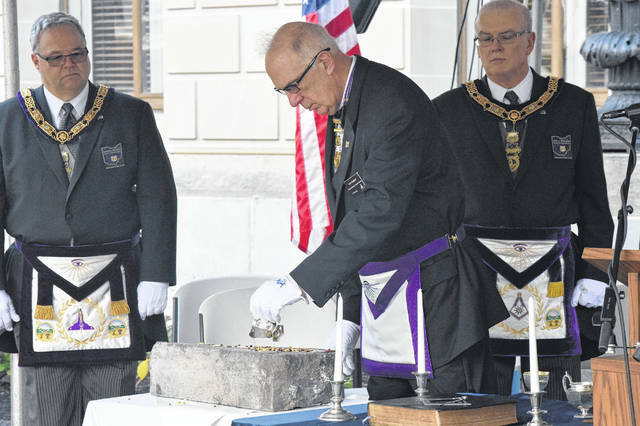 “A few weeks ago, we opened the cornerstone, which held the time capsule which was placed there over 100 years ago which held a snapshot of Preble County then,” Day noted. 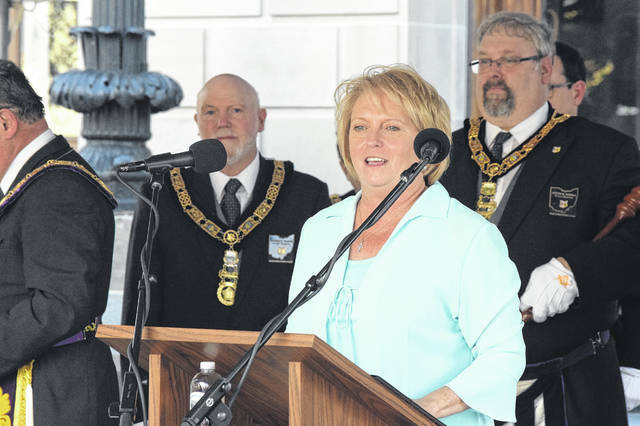 “Those artifacts have been on display in the courthouse since then. 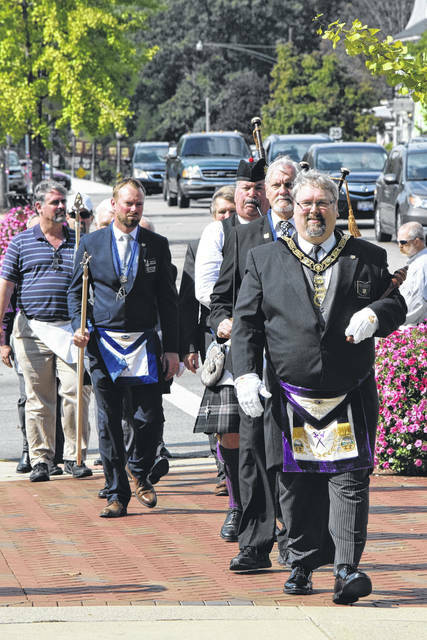 Since those artifacts have been on display, it has been my pleasure to see many Preble County residents observing them, trying to make a connection to their history. 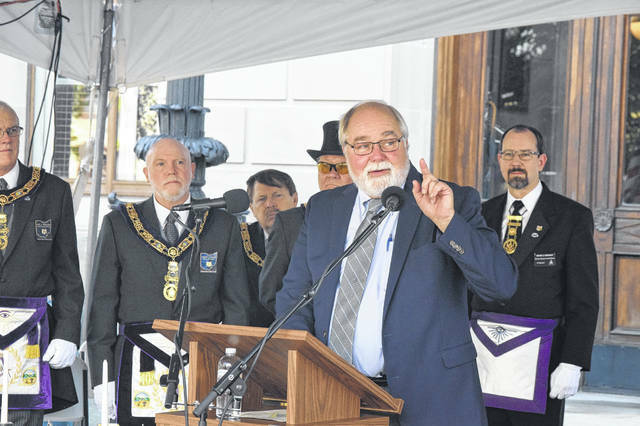 Doug Kramer, with Kramer and Associates, took the microphone to speak on the history of the courthouse construction. 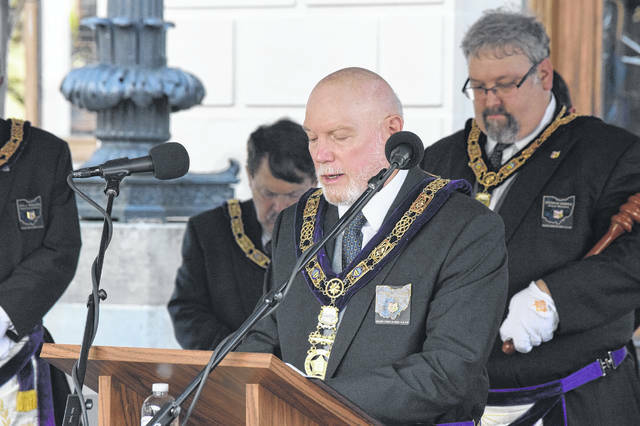 “I’m going to just touch on what would be a several hour speech. 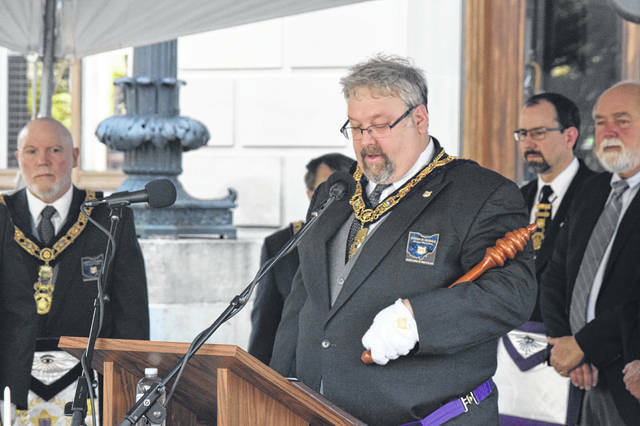 I will try to condense the history of the courthouse down to just a few minutes,” he said. 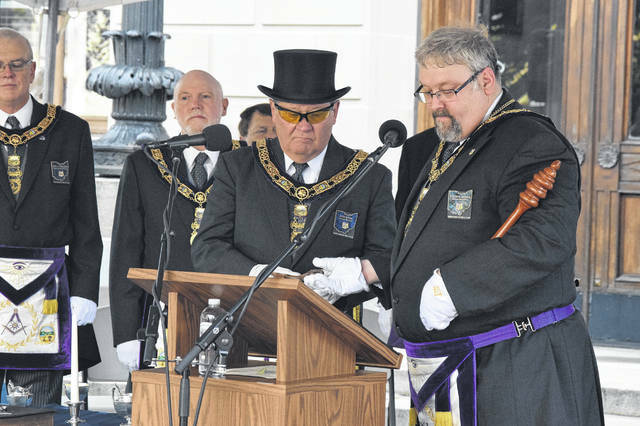 “The first courthouse was built on this present site in 1815. 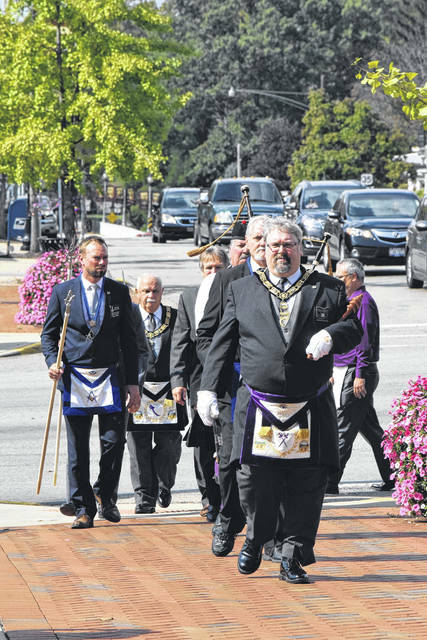 The cost was about $4,500, the citizens helped pay for it. It was razed in 1848. “Second courthouse was built in 1851 and cost $22,000, so six or so times the other courthouse. It was razed in 1917 to prepare for this, the third and present courthouse on this site. 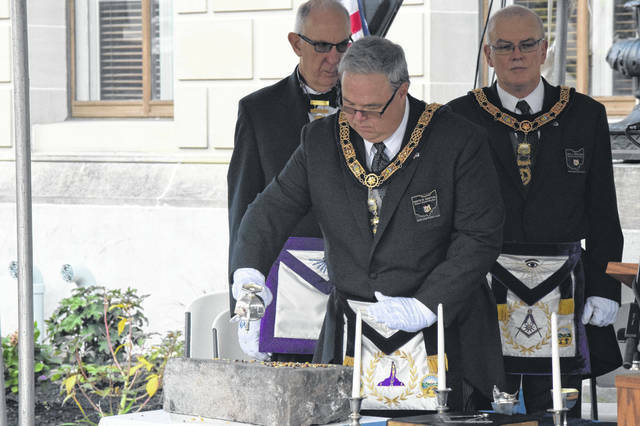 The cornerstone was laid on March 17, 1917. 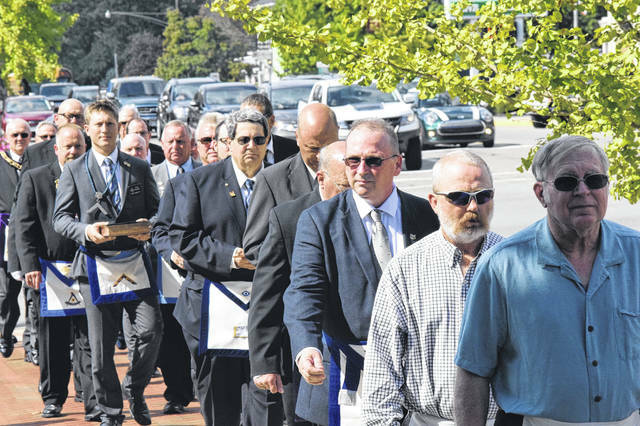 The building was completed and occupied then,” Kramer added. 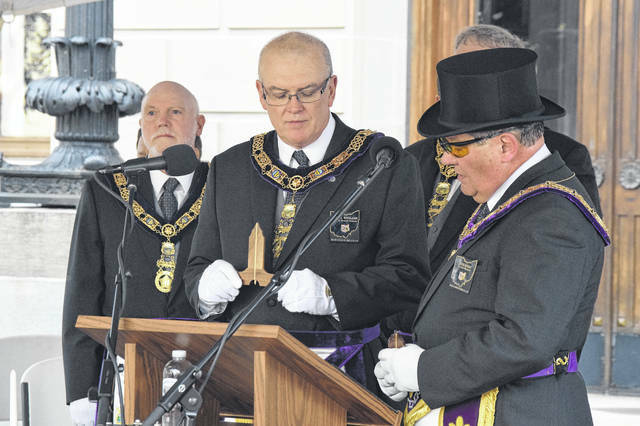 Grand Master Eric R. Schau noted, the stone the Masons used to hold the ceremony was a piece which broke off when removing the cornerstone. 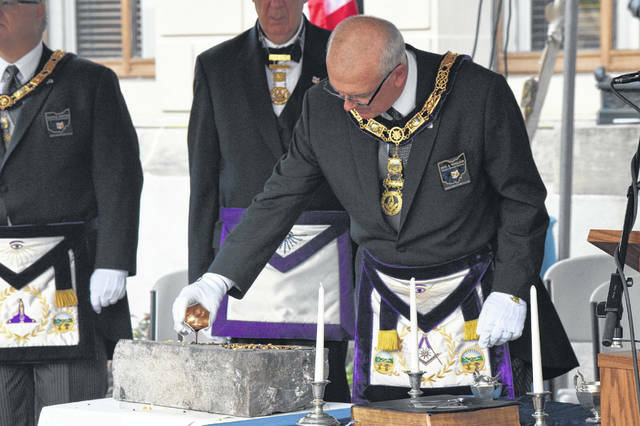 The original cornerstone will be put back in place with the new time capsule. 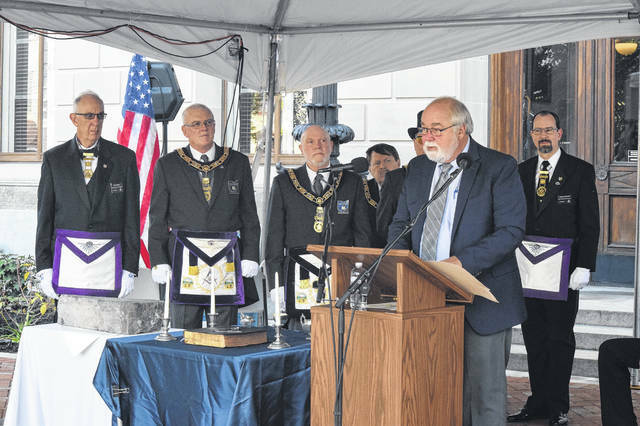 The new time capsule contains: the Holy Bible, Church membership directories from area churches, mementos and documents from the Courthouse Centennial Celebration, Preble County flag, County Seal, Plat Book, Fair Book, road maps, 48th Annual Pork Festival pamphlet, 7th Annual Commissioner Charity Ball booklet, Bicentennial Booklets from Camden, Gratis, Lewisburg, and New Paris, other Bicentennial items, letter from Sheriff’s office, Deputy Sheriff’s Patch, Sheriff’s Lapel Pin, pictures of current courthouse employees, poems and signatures from prosecuting attorney office, Preble County Job and Family Services staff directory; 2018 dog tag and dog registration form, Day in the Life of Preble County Ohio photographic essay volume one and two, General Assembly of State of Ohio House of Representatives Proclamation, 2018 Preble County Phone Book, Preble County Historical Society member list, recent editions of New Paris Communicator and The Register-Herald, members or directory list of several sororities and community service organizations, business cards from different businesses, pictures of the opening of the 1917 time capsule, construction plan of the 2018 time capsule, biography of yourself, Grand Master’s pin, cornerstone ceremony program, and the Holy Bible and change purse from 1917 time capsule. 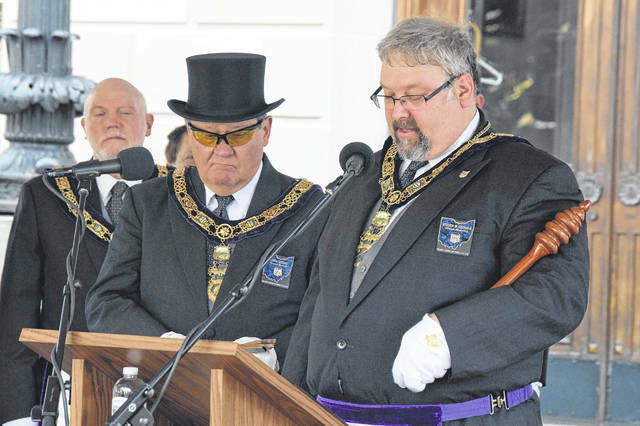 https://www.registerherald.com/wp-content/uploads/sites/41/2018/10/web1_Mason21.jpgThe Preble County Courthouse cornerstone is now home to a new time capsule, to be opened in another 100 years. 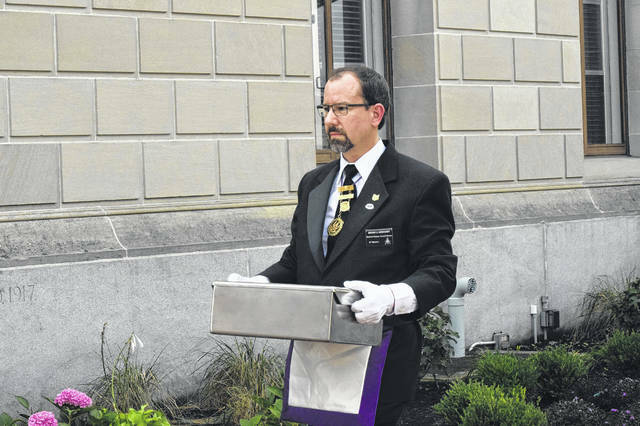 On Saturday, Oct. 6, a special time capsule ceremony was presented by the Grand Lodge of Free and Accepted Masons of Ohio.